Osceola, the most well-known leader of the Seminoles, was born in 1804, in a Creek town near Tallassee, present-day Tuskegee, Alabama. His Creek mother, Polly Copinger, was married to Englishman William Powell. Known throughout his youth as Billy Powell, Osceola’s early life remains relatively obscure. In 1813, armed conflict broke out among various Creek tribes in Alabama, and then expanded to disputes between whites and Creeks. These Creek Wars influenced the move of Osceola’s tribe further south, into an area between the St. Marks and Suwannee rivers in northern Florida. This movement of tribes was common as white settlement and subsequent disputes forced many natives southward from South Carolina, Alabama and Georgia. 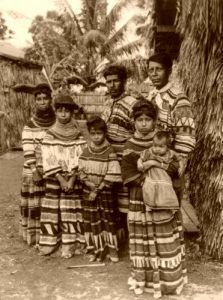 Over time, these various groups living in Florida, mostly of Creek and Hitchiti background, came to be called Sim-in-oli, or “wild” in the Muskogee language; this phrase was later Anglicized into “Seminole”. Efforts to escape conflict with whites ultimately proved futile. The process of relocating native peoples to territories as far west as Oklahoma was favored by the American government, especially General Andrew Jackson. 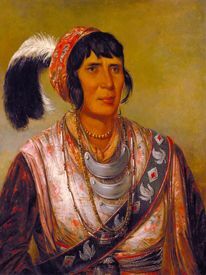 In the years following initial resistance to relocation, including the First Seminole War, 1817-1818, Osceola became an outspoken advocate for Seminole rights. The Indian Removal Act of 1830, signed by President Andrew Jackson, posed the greatest threat to Osceola’s desire for Seminole autonomy. Between 1832 and 1838, this Federal legislation directed the removal of the Cherokee, Creek, Choctaw, Chickasaw, and Seminole people to lands occupying present-day Oklahoma. Plagued by food shortages, adverse conditions, and disease, the “Trail of Tears” remains a haunting reminder of the fate suffered by many native tribes of the Southeast. While Osceola was not a chief by birth, his followers recognized him as such because of his natural leadership abilities. Putting his beliefs into action, he gathered fellow Seminoles in opposition against forced removal, during the Second Seminole War, 1835-1842, willing to go against both whites and other natives who cooperated with whites. On one occasion in 1836, Osceola killed a Seminole chief for selling cattle to whites at Fort King. Osceola attended several parleys with American officials, after which he usually left disgusted and dissatisfied. During one supposed treaty meeting near St. Augustine, Florida, Osceola was knocked out, bound, and imprisoned—all while under a flag of truce. 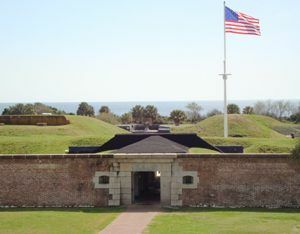 Following various attempts at escape, officials brought Osceola and several other Seminoles to Fort Moultrie, South Carolina in December, 1837. During Osceola’s stay here, many regarded him as somewhat of a celebrity. George Catlin, a well-known artist, portrayed Osceola while forming a brief friendship with the legendary Seminole. Osceola—whose name refers to the “black drink” or “asi”, combined with the call shouted after drinking this emetic, “yaholo” – resided at Fort Moultrie very briefly before succumbing to a severe throat illness on January 30, 1838. He was buried on the grounds outside of the fort, albeit without his head, which was removed by Dr. Frederick Weedon as a scientific curiosity. Today, Osceola’s legacy is representative of the struggle faced by many native peoples throughout the United States as encroachment by white settlers led to violent disputes and the eventual forced removal of most tribes to the present-day Southwest. Still at Fort Moultrie, Osceola’s grave provides a site to reflect on the life and times of this significant historical figure. Edited and compiled by Kathy Weiser/Legends of America, updated July, 2017.